Dallas, Texas–On October 27, 2015, the 2016 Scovie Awards judging panel of top culinary experts honored Gorji Gourmet Puttanesca Sauce with 2nd place in the prepared food, pasta sauce category. Chef Gorji’s savory, spicy sauce with vine-ripened tomatoes, fresh basil and garlic, capers, kalamata olives, and cayenne can be used with chicken, beef, seafood or any recipe requiring zingy tomato sauce. 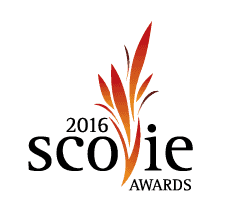 The Scovie Awards is an annual competition that recognizes the top fiery food products in the world. The awards were named after the Scoville Scale, a measurement of the spicy heat of a chile pepper. Dave DeWitt, founder of the Scovie Awards said there were 126 total companies entering this year. There were entries from 30 states and 8 countries: the United States, United Kingdom, Canada, Germany, Sweden, Austria, New Zealand, and Australia. “Companies from all over the world continue to recognize the Scovie Awards as the most competitive and challenging blind taste-tested event in the world,” DeWitt, said. At ZestFest, December 2014, Chef Gorji’s Arrabiata Diavolo, Puttanesca and Pomodoro sauces won gold, silver and bronze in the pasta sauce cook off category. The Arrabiata Diavolo also took second place in the 2015 best new product cook-off category, winning the coveted Golden Chile Award. 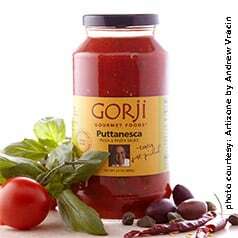 Gorji Gourmet Foods include: Pomegranate Vinaigrette, Dipping Oil/ Marinade and Arrabiata Diavolo, Puttanesca and Pomodoro sauces with imported olive oil and no added sugar. They can be purchased at area DFW Whole Foods, specialty gourmet stores and online at gorjigourmet.com, artizone.com and amazon.com. For more information about Chef Gorji and Gorji Gourmet Foods, please visit chefgorji.com. No Replies to "Gorji Gourmet Pasta & Pizza Sauce Wins Scovie Award"